If not Modi, then at least some of his supports have finally coming out with increasing number to either set aside or forgive Modi for the Godhra incident. They have been claiming to fight this election on the issue of development and that also only economic development. The conservatism of the current Gujarat government is visible most not only in case of their discriminatory policy against the Muslims on the issues related to religion or governance but also on economic issue of Muslims also. Even if we forget Godhara pogrom, the continuous killing of Muslims in fake encounter in the name of fighting terrorism cannot be ignored. For the time being, even after we ignore these judicial killing, how can we ignore the fact that the conditions of Muslims in Gujarat in terms of poverty, literacy, health, economic empowerment, employment etc either remain stagnant or deteriorated during the rule of Narendra Bhai Modi. In 2004-05 around 41% Muslims in Gujarat were involved in service sector which came down to 31.7% in 2009-10. In 2004-05, 59% Muslims were self-employed which came down to 53% while in case of salaried services the proportion of Muslims come down from 17.5% to 14% during the same period. It is also to be noted that Muslim share in causal labour increased from 23% to 32% during the same period. This means Muslims are repeatedly being marginalized in Gujarat in terms of better employment choices. They are being offered third grade unsecured and low wage employment. The total gap between Muslims and non-Muslims in terms of persons currently attending schools in the age group of 6-14 year is far more than national average. In 2001 when literacy rate (age above 7Year) in Gujarat was 69.1% the literacy rate of Muslims in Gujarat was at 73.5% but in 2007-08 when literacy rate of Gujarat went to 74.9% the literacy rate of Muslims in Gujarat remain at 74.3%. Gujarat’s CM blame fertility trends among Muslims for their backwardness but if that is so how Gujarati Muslims were doing well before the coming of Modi into power? The fertility rate among Muslims is highest in Rajasthan, UP and Bihar. The differences between fertility rate of Muslims and Hindu in Kerala is a much higher than in Gujarat but their situation is better in other things. The popularity of contraceptives among Muslims is only 1 % below than of Hindus. Muslim’s Participation in Sterilisation and IUD is slightly more than their ratio to population. At least in Gujarat, Modi cannot blame the Madarsa education for the bad performance of Muslims in field of education because the popularity of Madrasa education is least popular among Muslims of Gujarat. Muslims constitute about 9.7 % of the poor population in Gujarat but share of Muslims in most schemes (for poors) is below this figure. Their share is satisfactory only in SJSRY and NSAP schemes. In Krishi Bima Yojana Muslims got only 3.5% benefits; 1.4% of total power tiller; and 4.1% of total allocated tractor; while no loan from co-operative department or from Rural Development Department has been given to muslims..
Their contribution in forming Thrift and Credit Societies; micro enterprises is more than double then their ratio to population but their participation in training given (5.5%) for unemployed is less than their ratio to muslim population. 4.5% of benefits of house sites to weaker section given to Muslim. They got 13.9% of benefits in national family benefit scheme. Muslim has 12.4% of total bank accounts in Gujarat but the loan amount disbursed to them is only 2.6%. Individual deposit per account in scheduled commercial banks by Muslims is almost 20% higher than of Hindus. Despite that disbursement of loan to Muslims is less than loan dispersed to Hindu. Under SIDBI scheme the sanction of amount to Muslims is only 0.44 crore out of total sanctioned amount of 3133.77 crore during 2000-01 and 2005-06. Similarly the Refinance by NABARD to Muslims in Gujarat is only 1.7% of the total amount during 2004-05 and 2005-06. Based on the figures of Sachar Committee Report, Mr. Modi is claiming that situation of Muslim in Gujarat is much better than West Bengal. Modi is right in his facts and figures but United Nations has also observed that poverty head count ratio for Muslims is highest in the states of Assam, followed by Uttar Pradesh, West Bengal and Gujarat with forth position. When we compare the conditions of Muslims or any other community in two or more states we should first look into the historicity of that community in particular state. If we can refer to Medieval History, Gujarati Muslims till recent period were one of the most vibrant business community of the world. Remember the Bohras or Menons? If we compare those with that of landless Muslims of medieval Bengal province (consist of modern West Bengal, Assam, Bangladesh) who were converted to Islam because of their poverty. It is obvious that their contemporary conditions cannot be expected to be better than ST and ST Hindus because there is hardly any difference in terms of practice of casteism among Hindu and Muslim. 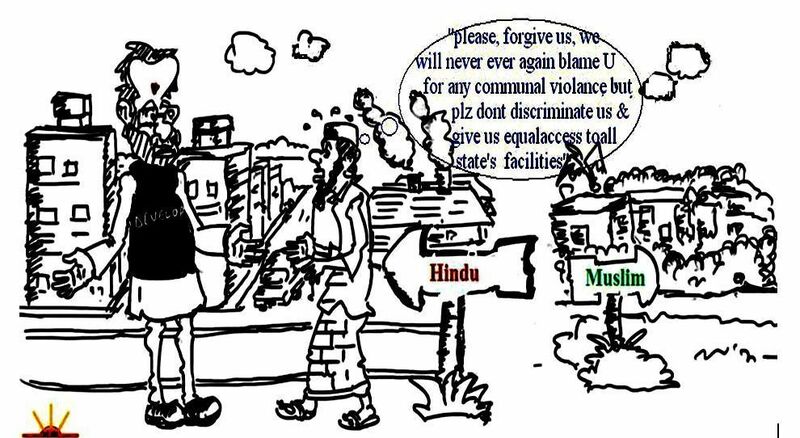 The caste atrocities of upper caste Muslims against lower caste Muslim has always been equally brutal. Our concern here not to find what is condition of Muslims of Gujarat at current time but instead to find what really had happen to them in last 10 years. Thus we need a comparative study of Muslims in Gujarat during the beginning and end of the decade. In terms of MPCE Muslims’s position is worse than even SC and ST in Gujarat (also Bihar Bengal, Rajasthan, MP, WB). So is the situation in case of urban poverty among Muslims. Ironically poverty among other minorities (christens and Parasi) of Gujarat is 0%. The same Sachchar Committe report states that Gujarat is one among the states where the work participation rate/ratio of Muslims is lowest. In most of the state Muslims’s participation in Manufacturing, trade and self employment is higher than of other religious groups but it is not the case with Gujarat. Self employment among Muslims in 1999-00 was much higher than among Hindus but by the end of decade the situation became totally opposite. In Rural Gujarat the ratio of self employment among Muslims during 1999-00 was much higher than Hindu but by 2009-10 the case is totally opposite. Same is the case with rural labour where the ratio of Muslims in rural labour was less than the ratio of Hindu in 1999-00. This simply means that muslims of Gujarat are being forced towards the ignored and less profitable rural economy. The ratio of self employment in Gujarat is lesser than national average for both Hindu and Muslims but at least for the Muslims same was not the case in 1999-00.